Hurricane season is officially upon us. After a rough season last year, we should all be prepared before the first storm arrives but it’s often a mad dash a day or two before. By taking time to create an action plan early on, you can avoid the stress of trying to locate emergency supplies when the lines are long and the supplies are low at the store. As an added bonus, you can stock up on qualifying disaster preparedness supplies tax free from June 1-7! Have a basic emergency home kit. Non-perishable food items and bottled water are the first things to sell out before a storm, but with planning ahead you can stock up and maybe even find a good deal. Make sure to account for every member of the family, whether its cans of baby food, special dietary restrictions or a bag of pet food for your furry family members. Other things to have ready: cash, a manual can opener, blankets, batteries, flashlight, portable charger and crank/battery operated radio. Make a plan. Does your family know what to do if a storm hits and your family is not together? If the kids are at school or you are at work, you’ll need a plan on how to connect with each other and where to meet. The Florida Division of Emergency Management offers the “Get a Plan” site, where they offer personalized advice and recommendations to develop a plan based on your family and location. Do your homework. 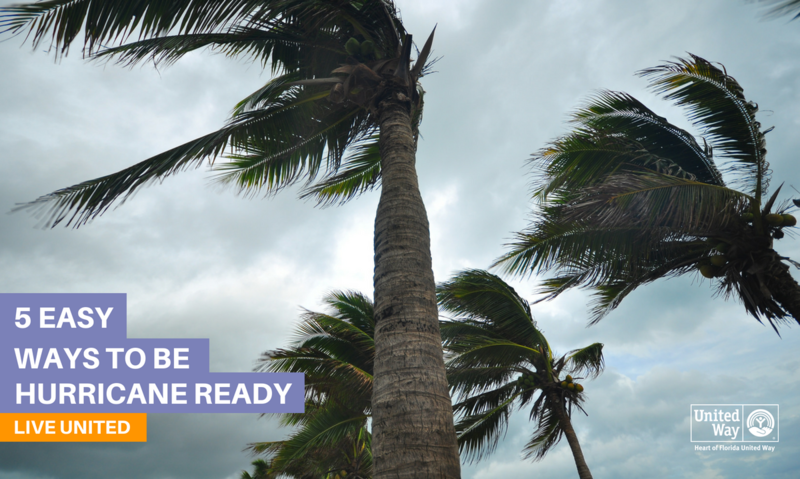 Ready.gov offers an in-depth guide about what to do before a hurricane arrives, the hours leading up to it and after the storm has passed. Besides being prepared for what’s to come, it can offer peace of mind to know what to expect in the event of a hurricane. Accommodate for your family’s special needs. By registering on the Florida Special Needs Registry, first responders are able to make informed decisions on how to help you in the event of an emergency. Additionally, it’s important to be aware of what your county’s special needs emergency shelter offers. Remember to call or text 2-1-1. United Way’s 2-1-1 Information and Assistance Helpline is available 24-7 and is Central Florida’s natural disaster helpline. They can help you find shelter and housing information, evacuation routes, sand bag locations, medical or hygiene items and more. You can contact them by dialing 2-1-1, texting your zip code to 898-211 or via chat on HFUW.org.